First and foremost, let’s talk about the most important thing this week. Happy Thanksgiving to you and yours. Just enjoy the company with your friends and family and everything else will take care of itself. YEAH RIGHT. It’s the last regular-season week of the fantasy football season! Scarf down that turkey and stuffing as fast as possible, get back in front of your TV and root for your players to play well so you can bury your opponent on this holiday of thanks. During episode number 25 of Prime Time Fantasy Football Adam Gori, Joe Webster and I all talk about everything fantasy-relevant heading into Week 13. It’s Thanksgiving week, so we figure there is no better way to kick off our show than with the Turkeys of the fantasy season! This is where we cover all of the guys who were drafted high and never panned out – making them (and in some cases us) turkeys. Never hurts to poke a little fun at misses like these. Then we get into some business. During “High/Low” this week we have a good mix of discussion between guys playing on Thanksgiving and guys with a full week of rest. 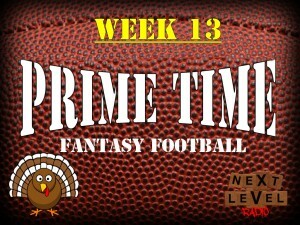 Find out what we think of Jordan Matthews, Tony Romo, Jay Cutler and Jeremy Maclin; all playing on Turkey day. Then find out what we think of Brandon LaFell, Ran Ryan Tannehill and Trent Richardson for Sunday’s tilts. We close the show with “Zero to Hero” and “Don’t Buy The Hype” this week. Stars like Calvin Johnson, Jordy Nelson and Eddie Lacy are topics of discussion here. See where the three of us fall in relation to those guys. Seriously though – wishing everyone the happiest of Thanksgivings this year and the best of luck heading into week 13. Readers and listeners are what keep us going, and I’m plenty thankful for all of you. Buy a t-shirt to keep us going in 2015!